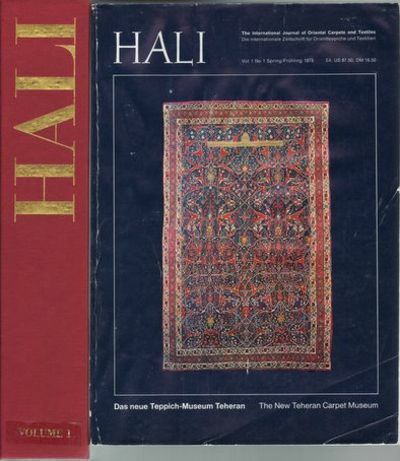 Hali - The International Magazine of Antique Carpet and Textile Art. (Issues 1-102). Issues 1 - 72 in publisher's original slipcases. A Hundred Pictures of Daiku at Work. Volume I only. Banabhatta's Biography of King Harshavardhana of Sthanvisvara with Sankara's Commentary, Sanketa. Edited with critical notes. In the Forbidden Land. An account of a journey into Tibet; capture by the Tibetan Lamas and Soldiers, imprisonment, torture and ultimate release brought about by Dr. Wilson and the political Peskar Karak Sing-Pal. Two volume set. An Account of the Polynesian Race, Its Origin and Migrations and The Ancient History of the Hawaiian People to the Times of Kamehameha I, three volumes in one. The Naturalist in Manchuria. Five volumes in the first edition. Histoire des Mongols depuis Tchinguiz-Khan jusqu'à Timour Bey ou Tamerlan. Four volume set.